The lack of space offered by a building is an age-old problem that architects, business owners and home owners have faced for many years. The occupiers may have outgrown the space and original use of the building and moving to larger premises is not always an option. However, improvements in glass technology throughout the 20th century, such as the Pilkington glass float glass production method provided a way for these problems to be tackled. The solution provided by the Pilkington was the ability to economically create ribbons of glass that can be cut into a variety of shapes and sizes allowing glass to become a core material in creating an aesthetically pleasing and cost effective extension to an older building without compromising on the natural daylight. The glass conservatory and orangery are the most common examples of a glass structure providing a home, business or civic building with extra space. Glass conservatories are so popular that they are now part of the tapestry of modern living and one would be hard pushed not to see a glass building of this nature on any given day of the week in the UK. In fact, glass technology has evolved so much that even listed buildings erected hundreds of years ago are able to reap the benefits of glass technology in architecture and add much needed space without damaging their historical appearance. The Holburne museum in Bath offers a perfect example of how a glass extension can add space to an older building but retain all of its period charm. Built by Sir Charles Harcourt Masters in 1795 – 96 the Holburne is a grade one listed building that has recently undergone a restoration. This work included the addition of a glass building to the rear of the gallery, and although it took ten years for architect Eric Parry to achieve (he overcame numerous local concerns and planning requirements) the results are stunning. The introduction of the glass extension has improved the building and has allowed for 60 per cent of the museums exhibits to be brought out of storage and placed on display for the enjoyment of the public. 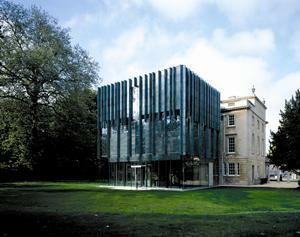 The Holburne provides a shining example of how glass structures can offer an ageing building the opportunity to create extra space without compromising its historical foundations.